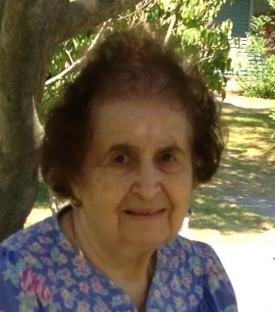 Eleni ‘Helen’ Doukas, a resident of West Roxbury for 64 years passed away peacefully Tuesday, March 26, 2019. She celebrated her 88th birthday on September 11th 2018. Born in 1930 in Greece, Helen was the daughter of Vasili and Vasilki Georgaklis of Greece. Helen was a talented seamstress, cook and gardener. She dedicated much of her career working for Polaroid Corporation. A devoted family woman, she enjoyed feeding anyone in sight and no one left her beloved home hungry. She boasted the green thumb of the family, always tending to her garden and plants, all that she planted grew to be beautiful and healthy. Helen enjoyed spending time in Cape Cod with her sisters, brothers-in-laws, children and grandchildren. Helen was the cherished wife and best friend of Peter Doukas whom predeceased Helen in March, 2018. Dear mother of Maryann Zitoli and her husband Paul of Westwood and Charles Doukas and loving companion Kathleen Walsh of Dedham. Devoted grandmother (‘yiayia’) to Peter Zitoli and his wife Katie, and Lauren Zitoli and her fiancé Oren Wolpe. Loving sister to Christine Kopellas and recently departed husband Fotios, Tasia Kourtis and her husband Fotios, the late George Georgaklis and his wife Ourania, and Voula Maheras and her husband Pericles of Greece. Dear sister-in-law of Clara Doukas as well as the late Ida and Ted Doukas. Also survived by many loving nieces and nephews. She eagerly awaited the prospect of becoming a great-grandmother this coming July and welcoming a new grandson marrying into the family in August. No words can describe what a wonderful, honest, hardworking and special lady she was. She “loved everyone” and was the best yiayia anyone could ask for. Never one to complain about anything, her constant smile and positive attitude were infectious and will be greatly missed by all. Visitation will be held Saturday, March 30th from 10-11AM at St. Nectarios Church, 39 Belgrade Ave., Roslindale, followed by a Funeral Service at 11AM. Interment in Mt. Hope Cemetery, Boston. In lieu of flowers donations to the Dana Farber Cancer Institute, PO Box 849168, Boston, MA 02284; or to St. Nectarios Church, 39 Belgrade Ave., Roslindale, MA 02131 would be appreciated. Condolences from the Arena family. Being present with Helen on any given day, was a constant reminder there’s still good & kindness in society. She touched people without judgment, but with grace and gratitude. She left an indelible mark in this world. Thank you for entrusting me with her care.